In the age of declining organic reach on social media, it has never been more important to encourage employee advocacy online. As a company, you might have a big following on social media, but as a group, your employees can reach a far larger audience on Facebook, LinkedIn, and Twitter than you’d be able to on your own. Employee advocacy is about turning employees into brand advocates, amplifying your company’s content, and increasing audience reach. But the benefit is more than just getting your company’s name out there. In fact, the benefits of social media advocacy to your company go hand in hand with the benefits that your employees get from participating. How can you implement an employee advocacy program that ensures that your employees not only participate, but benefit from it? I’ll go through some of the benefits of employee advocacy here, and how you can rally your employees to participate. What are the benefits of a social media advocacy program? Social media advocacy is an initiative for companies to be able to get more reach and heightened exposure for their brand, but it should always begin with the employee in mind. Being better informed: The biggest benefit for employees participating in a social media advocacy program is being better informed and more engaged with your company. A recent report by Gartner citing the Edelman Trust Barometer shows that only 42% of employees feel comfortable explaining what their employer actually does, while only 25% of employees feel that their employers do a good job of keeping them in the loop. With a social media advocacy program in place, employees have the chance to change that. One study shows that employees who are socially engaged are 20% more likely to stay at their company and 27% more likely to feel positive about the future of the company. Brand awareness: Employees also see the benefit of building up their professional brand on social media, getting more exposure in their field on networks like LinkedIn and Twitter and building out their connections. When it comes to recruitment, the benefits are even more tangible: 7% of applicants come from social referrals, but they account for 40% of all hires. This is also hugely beneficial to employers, and of course, the benefits to companies that have employees as social media advocates don’t stop there. Reach: This benefit may be the most obvious. Even 30 employees sharing with 500 Facebook friends, followers, or LinkedIn contacts increases your potential reach to an additional 15,000 people per post. The sheer possibility of significantly increasing your audience is a huge benefit of implementing an employee advocacy program. Credibility: Similarly, individual credibility can go much further than the perception of brands as corporate mouthpieces on social media. The same Gartner report shows that 83% of consumers trust product recommendations from someone they know personally, as opposed to only 43% which trust product ads on social networks. Having this peer trust is a huge advantage that individuals have over brands and that your employees can bring to the table. Lead generation: Finally, the results of increasing reach from credible sources will end in increased lead generation. Social selling tactics and improved engagement have been attributed to more closed deals, exceeding sales quotas, and increasing the odds of a sales success from a warm referral. Now, the challenge is getting your employees to participate. 1. Does my company have anything worth sharing? It’s easier to tell employees to share something if you actually offer something of value to share. This could be anything from corporate perks, to upcoming events, to quality content. Asking employees to share a crappy piece of content or straight PR about your company is a tough sell, but having things on offer, including interesting articles produced by the content team, will be a far more natural sell. SpinGo.com, an events management platform, was able to increase its engagement on LinkedIn by 500% and on Facebook by 200% thanks to an employee advocacy program that encouraged employees to share the benefits of working at the company, product launches, and most successfully, upcoming events around the city. Things that seemed like they already belonged on Facebook or LinkedIn performed much better in terms of engagement than things that were heavily branded and focused solely on the business. 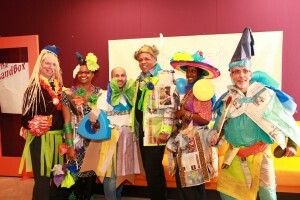 Again, this stems from the type of culture that your company has. If you’re providing employees with perks or benefits and let them share their excitement about that, you’re more likely to get useful engagement with employees and their pool of connections than you would by forcing them to share corporate-style PR stuff. When it comes sharing editorial or content marketing pieces, it’s especially important to make sure that your editors are proud of the content that they’re producing so that they’ll want to show if off online. If you’re a writer that’s written something uninspired, you won’t want to show that piece of work off as your own in your online social circles. 2. Should I put a social media policy in place? One of the biggest concerns on both ends of the employee advocacy spectrum is how comfortable both parties feel about sharing a company’s business on personal social media accounts. Employees fear that they’ll say the wrong thing, and employers fear that they’ll be represented in a negative light. There’s plenty of documented stories about employees sharing info or opinions about a company online that ended in disaster. This is when having a proper social media policy outlining what can and can’t be shared is essential. This will very much depend on the size of your company, but the more employees that you have and the more information about your company that’s being circulated, the likelier it is that you’ll want to implement a proper policy. Organizational concerns: it addresses company concerns about putting branded content in the hands of employees for distribution. Employee concerns: it addresses the concerns of those employees, who often don’t know what’s okay to share and what isn’t. Implementing best practices: it helps establish best practices among employees who may not be as familiar with particular social networks or posting guidelines. Adidas, for example, includes things in its social media policy outlining that employees are allowed to associate themselves with the company, as long as they make clear that their opinions are their own and not associated in any way with the corporate Adidas brand. They also have a section detailing how anything shared within internal networks should not be shared on personal social media accounts. How can you implement a social media advocacy plan that works? Once you’ve decided to move forward with a social media advocacy program and have outlined a policy for sharing, you’ll want to implement it properly in order to get maximum return for your efforts. This includes setting objectives, training employees, getting content ready, and creating a calendar. First, you’ll have to define exactly what it is you’re trying to achieve. Are you trying to boost social reach? Is the goal to generate leads from social media? 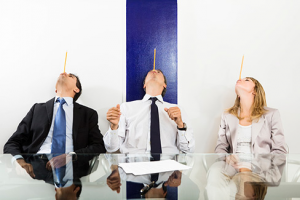 Do you want to improve employee engagement? Depending on your goals, your strategy to achieve them should reflect that, but you’ll want to make sure that you’re recording the right metrics to reflect your goals and pushing the right content to achieve those goals. If you want to increase employee engagement, for example, setting up a system of gamification that includes a leaderboard and rewards employees for sharing might be the best way to get started. Surprising as it may be, not all of your employees will know the ins and outs of every social media network. A quick training session on what to post, when, and where can get them up to speed quickly. This can also include training on social media management or content marketing software like Scoop.it Content Director to help employees manage their advocacy efforts. There are even tools popping up that are dedicated specifically to social media advocacy. The next step is to have a pool of content from which employees can pick and choose what they’d like to share. Finding content can be one of the most time-consuming parts of maintaining an active social media profile, and being able to provide your employees with fresh content will be much more encouraging when it comes time to share content. This includes both editorial content from your writers, as well as other content related to your brand or industry that might be of interest. Most social media marketers promote the 5:3:2 rule for sharing on a corporate account, which is a mix of 5 non-branded but topical pieces of content, 3 pieces of on-brand, non-sales related content, and 2 “humanizing” pieces of fun or entertaining content. The mix won’t be exactly the same for employees on an advocacy program, but having product-level, cultural-level, and market-level content to choose from will give employees a variety of options. After finding content, the second most painstaking part of being active on social media is knowing how much to share, and when. Creating a sharing schedule for employees and setting targets for sharing will help keep them on track without being overwhelmed. 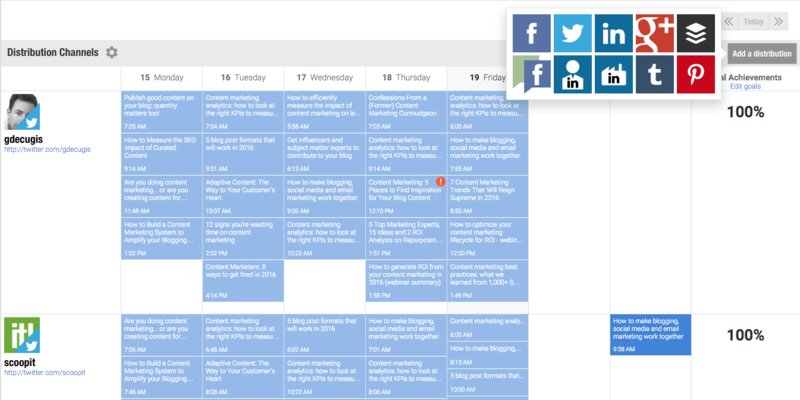 If you’ve curated a pool of shareable content and separated it into different content types (product, cultural, and market-level), you can set a schedule for the right content mix so that they can pick and choose as many pieces as they need per week. From here, your employees will have all the tools necessary to participate in your social media advocacy program. To get more of your colleagues participating in your content marketing efforts, you can also have them delegate their own social channels to you. This takes a certain level of trust, but one of the benefits is that you’ll never have to complain again about them not pulling their weight. You can automate the process by using smart social media publishing tools that have collaboration features that allow you to add as many social accounts as you’d like. Employees can share info about your company on social media regardless of whether or not there is a proper program in place. 50% of employees are already sharing about their company on social media; having an employee advocacy program simply allows for better control of that. The important thing to remember is that employees will only share things that fit into what they’d normally share with their online social circles. You can’t force a social media advocacy program on employees without having the proper culture, plan, tools, and content in place to get them engaged. Once you do, you’ll start to see the mutual benefits for your company, and a happier, more engaged workforce. Want to start generating more results from your content efforts? Get a demo of the new Scoop.it Content Director to learn how! Suzie is a writer and researcher at GetApp focusing on the social side of business– CRM, marketing, and of course, social media. Aside from musing about B2B software, she has experience writing about consumer apps for iPhone and Android, as well as research experience from the London School of Economics. 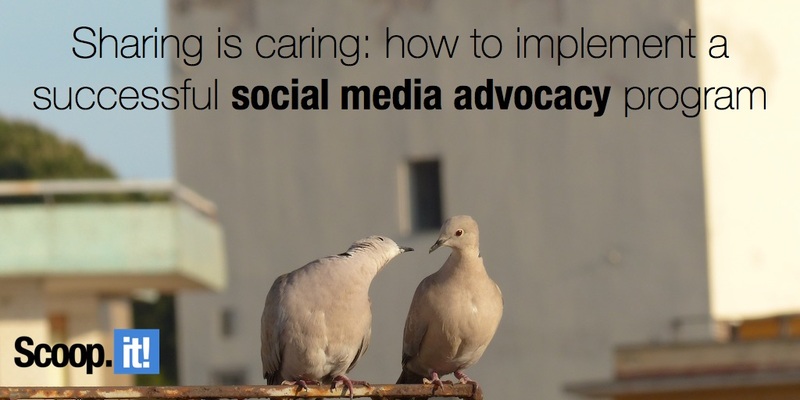 1 Comment on "Sharing is caring: how to implement a successful social media advocacy program"